The Model 570E transceiver is a self-healing, single mode fiberoptic transceiver that features 126 independent, high speed (115Kbps) virtual network communication channels and four to sixteen serial ports. You can assign each serial port to any virtual channel, which allows grouping Remote Terminal Units (RTUs) with common protocols. Two 10/100 802.3 compliant Ethernet ports are included as standard. The FiberPanel software is included with all Model 570E devices to implement a fiber network. The 570E-based network supports multiple RTUs, Intelligent Electronic Devices (IEDs), Programmable Logic Controllers (PLCs) and microprocessor-based relays. In addition, you can segregate different applications, allocate network bandwidth, and share backup master stations. This solution is optimized for use with Schweitzer Engineering Labs Mirrored Bits Protocol�. In H&L's redundant loop configuration, the network self-heals and reconfigures from loop to radial mode so quickly (6 msec) that relays such as the SEL-351 cannot detect the fiber break. The Model 570E transceiver is highly reliable, fault-tolerant, redundant, and offers both a rugged and cost-effective solution for self-healing ring and radial network designs. In addition to peer-to-peer communication, this device also supports all byte protocols including DNP and UCA. The Model 570E-16 option provides 16 high speed serial data communications channels for master/slave supervisory control and data acquisition systems (SCADA). 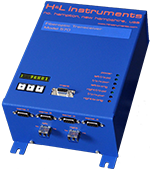 This transceiver automatically reroutes data in the event of a fiber break or or optical port failure. In transceiver mode, the device provides the interface with all remote devices including RTUs, PLCs, and IEDs. Two 10/100 802.3 compliant Ethernet ports are standard. 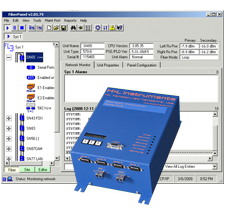 The IntelliTEAM II option equips the Model 570 to operate with the S&C 5804 Controller. 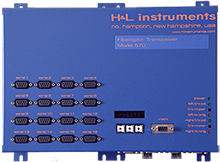 This version of the Model 570 transceiver uses a short case with a form factor that is dimensionally compatible with the S&C controller. The S&C 5804 IntelliTEAM II Controllers operate from a 12 volt power source. The Model 570i incorporates a high-efficiency 9-36V power supply for easy integration and compatibility with the S&C products. This Model 570 configuration option is not available with Ethernet support due to the smaller short-case packaging. The Model 570-EN provides the factory installed INCOM Communications Adapter Option. This option adds support for translating Eaton's daisy-chained signals from INCOM protocol devices to the H&L Fiberloop III system. The Model 570-EN permits collecting, viewing and interpretting real-time data from a variety of IMPACC devices. The Model 570-EN also includes two 802.3 Ethernet ports as standard. All Model 570 transceivers are bundled with the FiberPanel III configuration and diagnostic software for managing the fiberoptic network.